We are proud to introduce our VRSF Ceramic Coated Catless Downpipe for your N55 BMW. This downpipe is THE best bang for the buck mod available. By eliminating the restrictive catalytic converter in the factory downpipe, back pressure is reduced significantly which results in faster spool, an increase in power & a more aggressive exhaust note. Our catless downpipe are hand crafted from mandrel bent SS304 grade stainless steel and the turbo flange is precision CNC machined out of billet 304 grade stainless steel. All VRSF products include a lifetime warranty as well as our "No Hassle" satisfaction guarantee (including fitment). 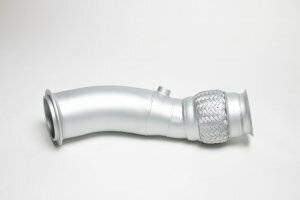 Please note that all M135i & 335i models produced up to 07/13 require the 3.5" version of this downpipe. M135 and 335i models produced after 07/13 require the 4" model of this downpipe. All M235 and 435i models require the 4" version of this downpipe. Note: Our N55 downpipes now comes ceramic coated free of charge. We use Cerakote's best thermal barrier coating which helps keep the hot air inside the exhaust and out of the engine bay which decreases overall intake air temps along with engine and transmission oil temps.